E. Čatrnja, I. Kalčo at the International Conference "Contemporary Problems of Mathematical Physics and Computational Mathematics" dedicated to the 110th anniversary of A. N. Tikhonov. In this paper we take both delays to have the same value and in its first part solve the direct boundary problem, construct the corresponding characteristic function and find the asymptotic behavior of eigenvalues. In the second part of the paper, we give the necessary and sufficient conditions for the existence of the solution of the inverse problem and give its solution by the method of Fourier coefficients. Bayramoğlu, M., Bayramov, A., Şen, E., A regularized trace formula for a discontinuous Sturm-Liouville operator with delayed argument, Electron. J. Differential Equations, Vol. 2017, No. 104, pp. 1-12, 2017. Bayramoğlu, M., Özden Köklü, K., Baykal, O., On the spectral properties of the regular Sturm-Liouville problem with the lag argument for which its boundary conditions depends on the spectral parameter, Turkish J. Math, 26, 421-431, 2002. Bayramov,A., Ozturk Uslu, S., Kizilbudak Caliskan, S., Computation of eigenvalues and eigenfunction of a discontinuous boundary value problem with retarded argument, Appl. Math. Comput. 191 , 592-600, 2007. El'sgol'c, L. E., Norkin, S. B., Introduction into the theory of differential equations with a deviating argument, Nauka, Moscow, 1971. Freiling, G. and Yurko, V. A., Inverse problems for Sturm-Liouville differential operators with a constant delay, Appl. Math. Lett., 25(17), 1999-2004, 2012. Norkin, S. B., Differential Equations of the Second Order with Retarded Argument, Amer. Math. Soc., 2005. Pavlović, N., Pikula, M., Vojvodić, B., First regularized trace of the limit assignment of Sturm-Liouville type with two constant delays, Filomat 29(1), 51-62, 2015. Pikula, M. Regularized Traces of a Differential Operator of Sturm-Liouville Type with Retarded Argument, Differ. Uravn., vol. 26, no. 1, pp. 103-109, 1990. Pikula, M., Čatrnja, E., Kalčo, I., Šaric, A., Solving Sturm-Liouville Type Differential Equa- tion With Two Deviating Arguments, Proceedings of IX International Scientific Conference "Science and Higher Education in Function of Sustainable Development-SED 2016", Užice, 76-80, 2016. Pikula, M., Vojvodić, B., Pavlović, N., Construction of the solution of the boundary value problem with one delay and two potential and asymptotic of eigenvalues. Math. Montisnigri, Vol XXXII, 119-139, 2015. Sadovnichii, V. A., Theory of Operators, Springer; 1991 edition, 1991. Şen, E., Bayramov, A., Spectral analysis of boundary value problems with retarded argument, Commun. Fac. Sci. Univ. Ank. Series A1, Volume 66, Number 2, Pages 175-194, 2017. Vojvodić, B., Pikula, M., Boundary value problem of differential operator of the Sturm- Liouville with $n$ constant delays and asymptotic of the eigenvalues. Math. Montisnigri, Vol XXXV, 2016. Vojvodić, B., Pikula, M., Vladičić, V., Determining of the solution of the boundary value problem of the operator Strum-Liouville type with two constant delays. Proceedings, Fifth Symposium Mathematics and Applications, Faculty of Mathematics, University of Belgrade, V(1), 141-151, 2014. Yurko, V. A., Introduction to the theory of inverse spectral problems. Moscow, Fizmatlit, 2007. ISNAD Pikula, Milenko , Čatrnja, Elmir , Kalčo, Ismet . "Spectral problems for operators with deviating arguments". 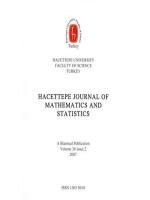 Hacettepe Journal of Mathematics and Statistics 47 / 5 (October 2018): 1172-1183.